On Wednesday night I finally got around to starting writing my thank you notes for Rosie’s christening guests. Her baptism was almost a month ago. I got two written before she woke for her first resettle, and by the time I re-emerged from her nursery, I had gotten out of the mind space of an efficient, polite mum and gotten on my cranky hag hat, so I abandoned the pile of stationary (but I didn’t give up on my glass of wine). Next morning over breakfast, Bean spotted my pile of notes, and swiftly fetched some envelopes to begin writing his own. Over two days we talked about all things postal; Australia Post, Postman Pat, high-vis vests, 50cc scooters, and going postal. Actually not that last one, that was just me. It was a crazy week. I should have guessed we’d have a post game happening soon. There’s a post box set up at kindergarten that Bean’s been enjoying, and my boys love to meet our lovely lady postie at the letterbox. They call out to her “Bye, Pat! !”, she goes with it. We talked and talked, then set about writing. Little man scribed the letters, signed them off, decorated the envelopes, stamped them, licked them all (with a lot of spit, but they had cheap un-sticky glue and I had to stop him when I had flashbacks of what happened to George Kastanza’s fiancé in Seinfeld). Littler man just scribbled all over the envelopes in a decorative fashion. Anyway. By Thursday afternoon we had a neat pile of packaged up, addressed and stamped (albeit with Toy Story stickers), letters contained in envelopes. Finally it was time to decorate our Hyandai postal truck, don costumes and get on the road. 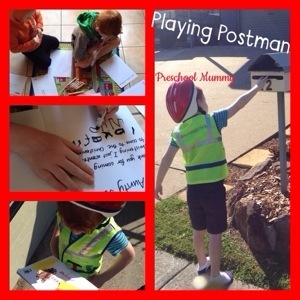 Bean took his role quite seriously, and had heaps of fun delivering his letters! Bug loved coming along for the ride, he’s such a good little sport. Rosie was just squealing the whole time. I’m choosing to believe they were squeals of delight. Don’t shatter my illusion. Play is so important for our little ones. So maybe I’m nuts but I love helping develop their ideas with passion, and encouraging them to explore through play. Would you play a game like this? All you need is a tank of petrol and some paper and pens! Or am I actually bonkers? Tell me! Previous Post Conversations With Strangers: The first-date question that changed my life. Next Post How do you relax? So cute! What a great idea 🙂 where did they post to – family & friends? My Little Miss 9.5mnths currently likes to “post” toys & trinkets into drawers and all sorts but I’m looking forward to carrying on the tradition of handwritten mail once she gets bigger. Thanks ! Yes they just made a list of lucky recipients who live nearby and wrote each a small note.